The MP-DINRAIL is a two piece ABS adapter that is custom designed to convert the standard MACH-ProCom, MACH-ProSys, MACH-ProPoint, and MACHPro1/2 enclosures to be DIN rail mountable. 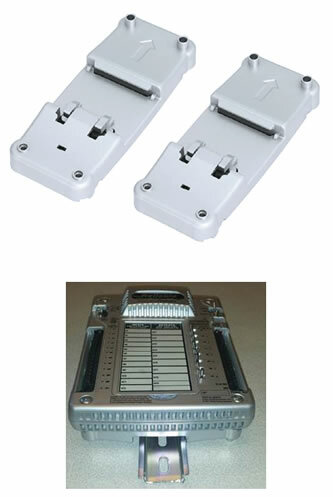 Adapter kits use the standard #8 TEK screws that ship with the controllers to fasten the adapter to the enclosure. Once the adapter is secured to the enclosure it can be installed to a DIN rail by hand. Controllers can be removed simply by pushing the spring loaded DIN rail to release. No tools are required. The adapter kit works on all the following families of controllers: MPW-C, MPW-S, MP-C, MP-S, MPP-I, MPP-I/O, MPP-I/O-U, MPP-O, MP1, and MP2. The DIN rail adapter fits inside the existing footprint of the product therefore only the height dimension is increased by 5/8” (16mm). No screws, no programing, no problem. Just snap on and go!